Four artists from Fellowship Place’s Expressive Arts program were invited to exhibit original artwork in the rotunda of the New Haven Lawn Club, for a two-week period from October 26 – November 8. The exhibition entitled “Inspired”, included work by painters Do Walker, Leigh Busby, Maxwell Clark, and multimedia artist Nancy Black. At the opening reception on October 28, the artists shared their life stories and talked about what brought them to Fellowship Place. 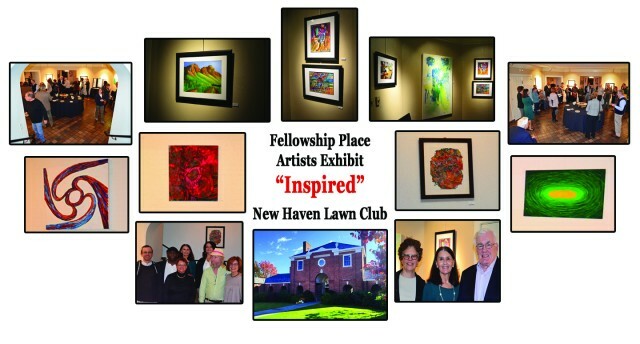 Pictured with the artists are Fellowship Place Board Vice President, Renee Redman, Board member Andrew McLaren, Fellowship Place Executive Director Mary A. Guerrera, Expressive Arts Coordinator, Kyle Barreuther, and Lawn Club Art Committee Co-Chair, Debbie Cook, who recently joined the Fellowship Place Board of Directors.